Summary: The description, specs, pricing, photos and user ratings of the Trabzon Regent R100 pistol. Umarex USA is importing the Regent R100, a 1911-style semiauto manufactured by Trabzon Gun Industry (called Tisas for short) in Turkey. 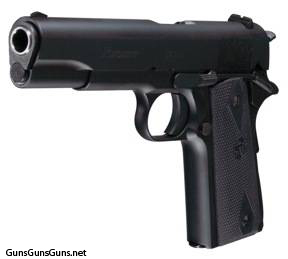 Chambered in .45 ACP, the Regent is built on a steel cast frame and carries Hogue grips. It sports a blue finish (a stainless version will be introduced later this year). The R100 from the right. a stainless steel hammer-forged barrel. 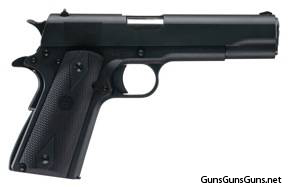 Note: Trabzon calls this pistol the Zig M 1911. This entry was posted in .45 ACP, $251-$500, $501-$750, 1911, Full size, Semiauto, Trabzon, Umarex USA on March 11, 2011 by Staff.